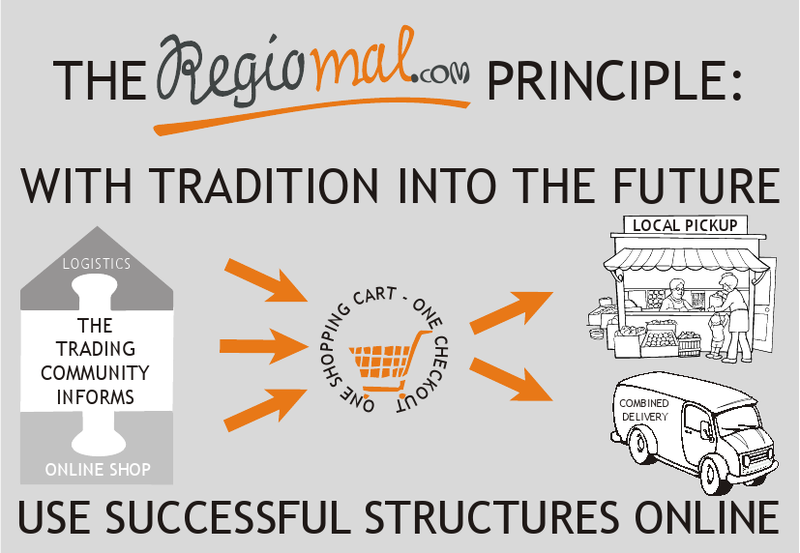 Regional Online-Marketplaces: New Opportunities for Traditional Trade! Inner cities, greenfield development sites, shopping malls or farmers markets: traders often cluster into communities of purpose at a common location. In part, this is a historically developed strucure – a proven system. Regional Logistics: This means same-day delivery into the regional delivery area of the online marketplace. Also there will be a combined shipment for products from any seller on the same regional oneline marketplace, which affords very economical shipment costs. Together, this adds a whole new quality to online shopping. Also, new services for the group of physically challenged senior people become possible: the regional logistics offers a way to get in-store purchases delivered to ones home comfortably, while paying shipment costs only once. Advertising for local businesses: A regional online marketplace aggregates information about locally available offers, granting customers an ideal overview about what is available for what price. Advertisement spaces on the homepage would show current deals offered by various merchants. Shopping list feature: Even without creating an account, visitors can collect articles they intend to buy from the various sellers on the marketplace by placing them into a shopping list. The shopping list can then be saved or printed, which offers a good way to plan for ones next shopping tour. Pre-order for local pickup: After ordering online, customers could select the most comfortable way to obtain their purchases. Options include pickup from local stores, and centrally located drive-in pickup facilities. These drive-in facilities continue to work after shops close down in the evening. Buy online within your local area: Even when you purchase it online, a regional purchase strengthens your local taders, manufacturers and infrastructure. There are many environmental benefits as well due to short distances, an intelligent combined logistics, and re-usable transport packaging. In total, it is a strong counterproposal for the current, distributed way of online trade. Unique product range: A regional online marketplace would contain products from large retailers, small local manufacturers, regional producers and farmers, and from Fairdirect producers. This is a unique product range, which combined with fast regional delivery is another important competitive advantage. Tap into new customer segments: An online wholesale area that is closed to consumers allows commercial customers to purchase larger amounts at better rates. For example, a local gastronomy kitchen which likes to utilize local products but sometimes lacks the time to visit the farmers market, can order from multiple sellers of that local farmers market in one combined e-commerce order. Optionally, they can complement this order with items from any other seller on the this regional online marketplace. Everything will be delivered to the customers premises, fresh, in one shipment, and within a short time. These modules can be used together or individually and stand-alone. They allow to open up new customer segments within the region and, if desired, also beyond. In addition, they allow to provide better service to existing long-term customers. Together, it is an important contribution towards better local amenities in structurally weak towns and city quarters. Every seller can set up their own, fully fledged online shop within the regional marketplace. If they already operate an own webshop, they may connect it through an API interface. They will get pre-orders from customers, which allows to optimize stock levels in their shop. Also, they can utilize a newsletter feature to inform their registered customers in a targeted way. Comprehensive coverage for local supply, dying inner-city business areas, sustainable use of plant and animal food resources, food waste and air pollution in cities are frequently debated issues at the current time. Regional online marketplaces help to solve them in an innovative way. We have developed (and extensively tested) the complete software infrastructure for the online marketplaces presented here. Here you can find detailed information about its history, structure and architecture (in german). Also, as a reference you can find an active marketplace using our software and several of the presented features here. For more information, you are welcome to send us an e-mail.